Did you know I'm a Coconut Queen? No I haven't lost the plot, I'm a brand ambassador for the sassiest online store around. They don't even mind if you ride your Unicorn through the shop pages! Love riding Unicorns being sassy and filling your life with fun? Well Coconut Lane might just be the online store you've been waiting for. I thought I'd share some of my fave products from the store and share my whopping 20% off code with you (pay day is on it's way guys!). With summer on it's way these matte black glasses are not only on point but are perfect for keeping in your handbag! I always forget my sunnies and end up squinting so these would be perfect to keep in my car! If someone doesn't get me this card at some point I'm totally going to have a tantrum! You are the Queen to my B, how fitting! I love flamingos and was over the moon when I saw them in the flesh in Florida, however what's second best to seeing an actual flamingo? A bright pink flamingo sticker of course! I can see these beauts decorating the front pages of those notepads I have around my office. Now in keeping with the whole Queen B thing... this gorgeous crown ring is right up my street and comes in 3 different colours, so you can mix and match to suit your mood. I've got these socks on pre-order and basically I'm not going to get anything done once they arrive. Channing Tatum socks, like photos of Channing Tatum on my person. If you didn't already know, Mean Girls is my all time fave film. Any chance to use a Mean Girls quote, I'm there so this phone case is so fetch! Finally the Queen herself, Beyonce. This is the perfect one to have in your bedroom or office for those tricky situations. Doughnuts or cookies... What would Beyonce do?! 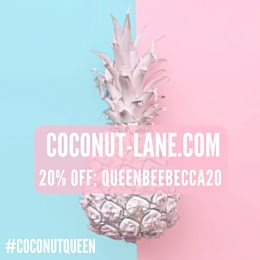 Don't forget to use the code QUEENBEEBECCA20 at checkout for 20% off your entire purchase!